Anime is an animation that originated in Japan. It is an abbreviation of “animation” in Japanese. It features hand drawn or computer animation that is characterized by colorful graphics, clean lines, bright colors, amazing themes and vibrant characters. This diverse art form with its distinctive method and techniques has been well adapted all across the world. It usually features people with wide, huge eyes, long hair, long arms and legs, thin waist and varied facial expression. 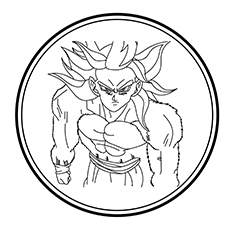 Here is a colouring sheet of Goku, the archetype of modern anime lead characters. Goku is the protagonist of the cartoon series “The Dragon Ball Z”. This courageous Saiyan was originally sent on a mission to destroy the earth. However, an accident alters his memory, causing him to become pure hearted and the greatest Earth’s defender. Goku is commonly seen wearing his orange ‘Gi’ over a dark blue undershirt. Tell your child to use these shades while coloring. 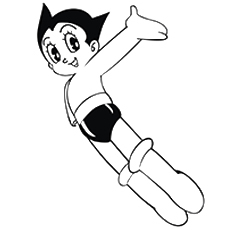 Astro Boy is one of the oldest anime characters. 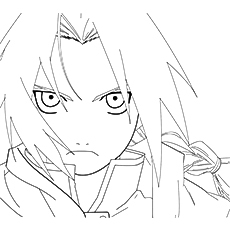 It is one of the characters that helped to usher the phenomenon known as anime. The Astro boy is the main character in the Astro Boy Series. The story is an amalgamation of Pinocchio with science set in the post-war atomic age. Beyond those long lashes and cute smile is a boy who has the strength equivalent to 100,000 horsepower. 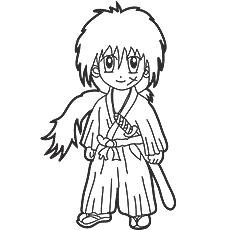 Himura is the protagonist and titular of the series Rurouni Kenshin. He has unusual violet eyes that reflect his psychological reversion to Hitkori. Himura Kenshin is the most polite character in the anime history. He is a soft-spoken man who always puts others before himself. He carries an amicable temperance and freely gives his service to people who need a hand. Vegeta, the prince of the Saiyans and the arch rival of Goku is one of the most important characters in the anime history. 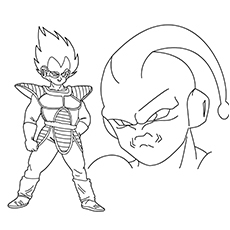 Vegeta has received more character development than a number of other characters in the series. Vegeta was once a ruthless warrior and outright killer, but he later abandoned the idea to become the universe’s most powerful warrior. Like most of the anime characters, Vegeta has jet-black hair, sharp features and huge eyes. Edward Elric is the protagonist of the series “Fullmetal Alchemist”. He is the youngest state alchemist, achieving his certification at the age 12. Edward is a lovable and dim-witted person with a heart of gold. Edward is a truly dimensional character. He is portrayed as a funny, intense, fierce and nice person in the series. He is diabolical, calculating, conniving and determined to remake the world according to his image. His ultimate goal is to make the world a happy and safe place. Light Yagami is a young man with light brown hair and brown eyes. He is always shown dressed neatly in his school uniform or a suit. 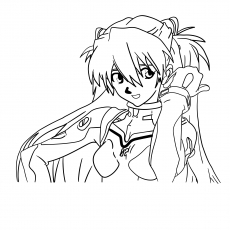 This is one of the cutest anime colouring pages featuring Asuka Langley Soryu is a character from the Neon Genesis Evangelion franchise. She is part Japanese, part American and part German. Asuka is a proud and cocky and always wants to prove that she is the best at whatever she does. Haruko Haruhara is an extraterrestrial investigator for the Galactic Space Police Brotherhood. She is a spontaneous, energetic and hot pink haired 19-year-old girl who works as a maidservant. She is the most erratic character in the show and most of the things she does make little sense. Kakashi is an iconic and laid-back character in the Naruto manga. He is smart, reliable, relatable and totally devoted to his students. He is the kind of teacher that every student wishes to have. 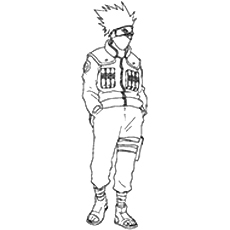 Kakashi, since his childhood, was an independent and self-confident boy. Vash the Stampede is the main character of Trigun, an anime series. He is a gifted superhuman with amazing fighting abilities. His vow to never take a life provides intense drama to the series. He is extremely strong and powerful and none of the criminals he faces stand a chance against him. 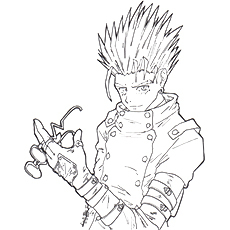 Vash is also called “the humanoid typhoon” because of the destruction that follows him wherever he goes. Lelouch Lamperouge is the protagonist and anti-hero of “Code Geass: Lelouch of the Rebellion”. Lelouch is an example of a hero gone astray. His rise and downfall is Shakespearean in nature. His pride clouds the judgment, which leads him to miss out on things that are truly important. His trademarks include ebony hair and violet eyes inherited from his parents. Arsene Lupin III is the protagonist of the anime series “Lupin III”. 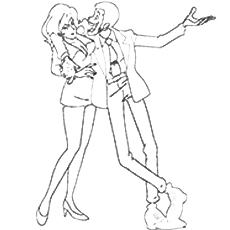 Lupin is regarded as the world’s most wanted “gentleman thief”. He, along with his gang of thief friends go about stealing the world’s most valuable things. He enjoys stealing so much that he gives away most of the things that he owns. He is a modern day Robin Hood, but with style and panache. Haruhi Fujioka is the character of the series “Ouran High School Host Club”. She is an intelligent girl belonging to a middle class family. 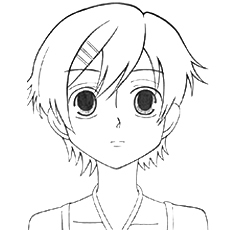 Having been raised under less influential conditions, Haruhi has seen a fair share of difficulty in life. She is more practical and responsible than most of her classmates in her school. Afro, also known as Afro Samurai, is the first black male character in an anime. 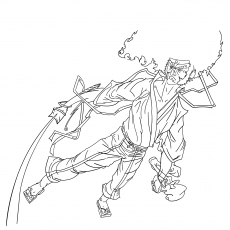 He is the protagonist of the Afro Samurai series. Afro is an extremely talented swordsman. He is a strong and silent man who prefers to let his sword do the talking. Afro wears a white Japanese folding shirt, baggy ripped pans and two headbands. This is one of the interesting anime coloring pictures, that features Pikachu the most loved anime characters of all time. He is a major representative of the Nintendo’s collective mascot. Pikachu is a small and a chubby mouse covered in yellow fur. Its long, yellow ears are tipped with black. Its large tail is shaped like a lightning bolt. Its cheeks have two red pouches that are used for storing electricity. 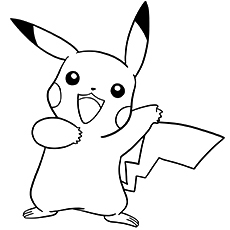 The pouches turn yellow and spark with electricity when it is about to use an electrical attack. 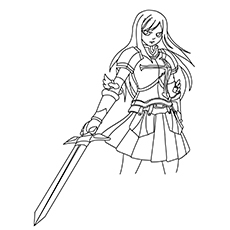 Erza Scarlet is an S Class Mage, famous for her usage of Requip Magic. She is one of the main female protagonists of the series “Fairy Tail”. Ezra is a beautiful and slender woman with long, scarlet hair and brown eyes. She wears custom-made armour, a blue skirt and black boots. Her fairy tail stamp is located on her left, upper arm. Ezra has a strict personality and often criticizes the bad behaviour and habits of the other guild members. Winry is the supporting character in the series “Fullmetal Alchemist”. She is the sidekick of the main protagonists Edward and Alphonse Elric. 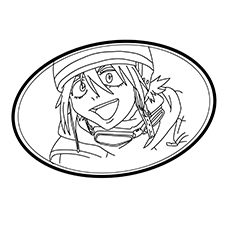 Winry is an amateur surgeon and a repair enthusiast. She is an attractive woman with long, light blonde hair and blue eyes. She wears her hair in a long ponytail with bangs falling casually on her forehead. She is an emotional, strong willed woman who puts all her heart and soul into whatever she does. Nami is one of the main characters from the series “One Piece”. She is one of the smartest characters of the series. She is introduced as a thief who possesses skills to draw sea charts and tell the climate. Her dream is to draw a map of the entire world. 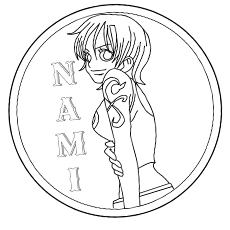 Nami is an intelligent girl, but is totally obsessed with money, primarily because of her difficult childhood. 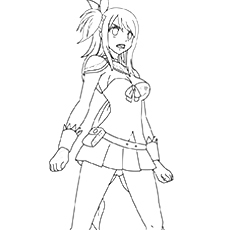 Lucy Heartfilia is the main protagonist of the “Fairy Tail” series. 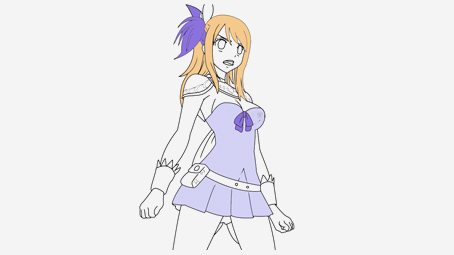 She is a member of the Fairy Tail Guild and Team Natsu. Lucy has brown eyes and shoulder length hair that is tied with ribbons. She wears a black dress and leather, high-heeled boots. Her Fairy Tail stamp is located at the back of her right hand. Lucy is extremely proud of her appearance and exudes a certain amount of vanity. She is a kind and caring person and is very passionate about literature. 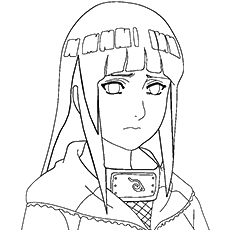 Hinata Hyuda is a member of Konohagakure’s Hyūga clan. Due to her meek disposition, she loses the position of the heir to her brother. She is a shy, serene, kind and polite woman noted for addressing people with proper honorifics. She is also very emphatic and shares the problems of people. 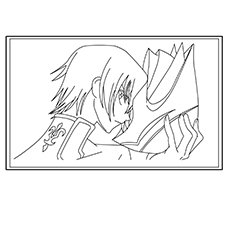 These free printable anime coloring pages online will keep your child occupied during his spare time. Regular colouring will also improve his hand-eye coordination and fine motor skills. 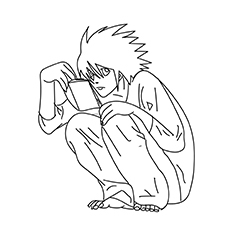 You can also create your own anime coloring book. 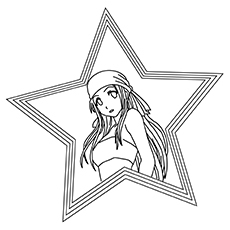 Let us know how your child performed with these free anime coloring pages to print in the comment box below.